According to The Hollywood Reporter, another award-winning actor is about to get swept up in the ever-expanding Marvel Cinematic Universe. 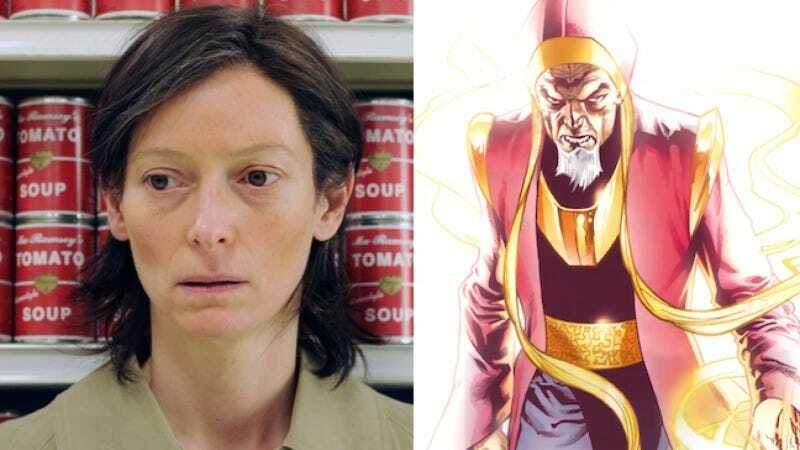 That actor is Tilda Swinton, and she’s reportedly “in negotiations” to join the Doctor Strange movie as the mysterious and magical Ancient One. In the comics, The Ancient One is a very elderly man (like, very elderly) who once held the title of Earth’s Sorcerer Supreme—which basically means that he was the best magic guy. Eventually, he has to train an apprentice to be the new best magic guy, and—at the risk of spoiling a decades-old plot point—he settles on a doctor named Stephen Strange. Now, keen-eyed readers may have noticed that we’ve been using the gendered pronoun “he” to describe the character, and that’s because the The Ancient One is traditionally a man. Interestingly, Tilda Swinton is not a man, which is a trait that she shares with about half of the human race. THR‘s report says that Marvel was originally planning to hire a man for the part, but it “rethought the role and has now made it female.” Take that, misogyny! Doctor Strange will star Benedict Cumberbatch in the titular role, and although Strange isn’t the most well-known Marvel character to the general public, the idea of seeing Tilda Swinton teach Benedict Cumberbatch how to do magic is the sort of totally weird thing that you’re not going to see in any other movie ever. We imagine that will sell a couple of tickets on its own. Scott Derrickson will director Doctor Strange, and it will appear in theaters—as if by magic!—on November 4, 2016.